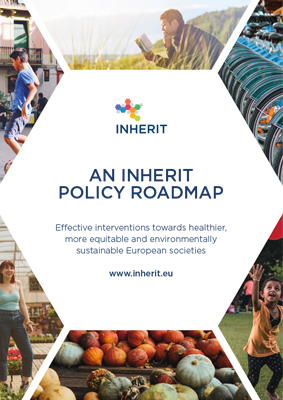 The INHERIT Policy Roadmap for effective policy interventions promotes healthier, more equitable and environmentally sustainable European societies. Achieving healthier, more equitable and sustainable European societies requires some fundamental changes in our current lifestyles and behaviours. For an optimal outcome, the necessary changes should be planned as part of a holistic vision. The INHERIT project policy roadmap contains a set of 20 policy interventions covering leverages and opportunities in four lifestyle areas: green space, energy efficient housing, moving and (food) consumption, and a fifth ‘general’ area. The policy suggestions are a combination of top-down and bottom-up approaches and hard and soft measures, ranging from legislative, environmental and social planning to service provision or communication and marketing policy. The successful implementation of these policies requires the engagement of actors from several sectors operating throughout Europe. Thus, the report first and foremost addresses policy makers followed by businesses, CSOs and other organisations as well as citizens themselves as key policy implementation partners and beneficiaries.